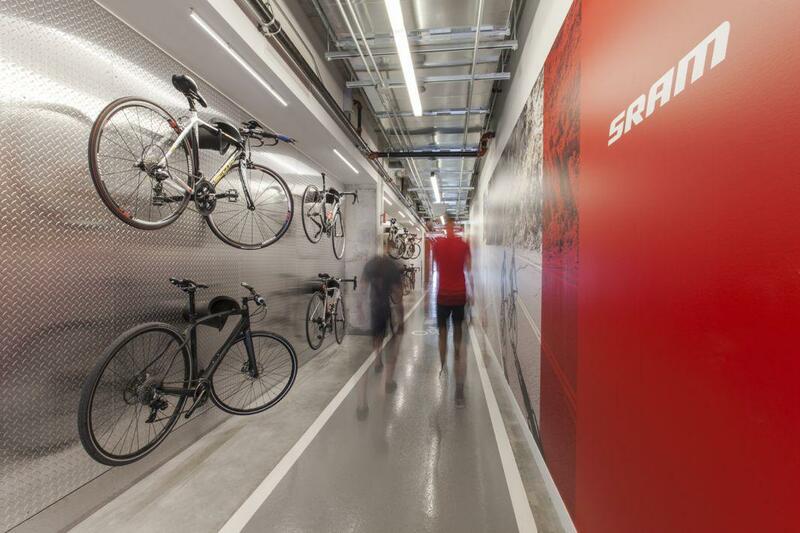 Perkins+Will design of SRAM headquarters is a bike-friendly dream office. 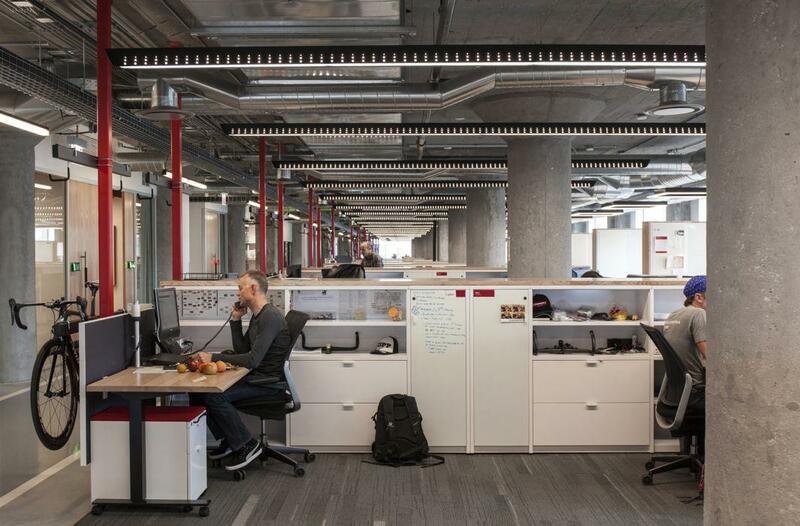 A truly bike-friendly office designed by Perkins+Will at the Chicago world headquarters of bike parts manufacturer SRAM includes indoor cycling lanes. 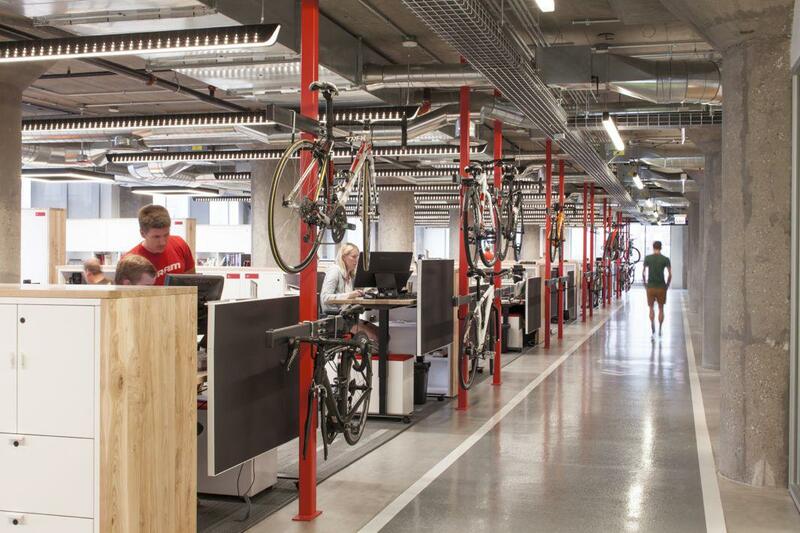 Will the resurgence in urban cycling ever be matched by a rise in bike-friendly offices? 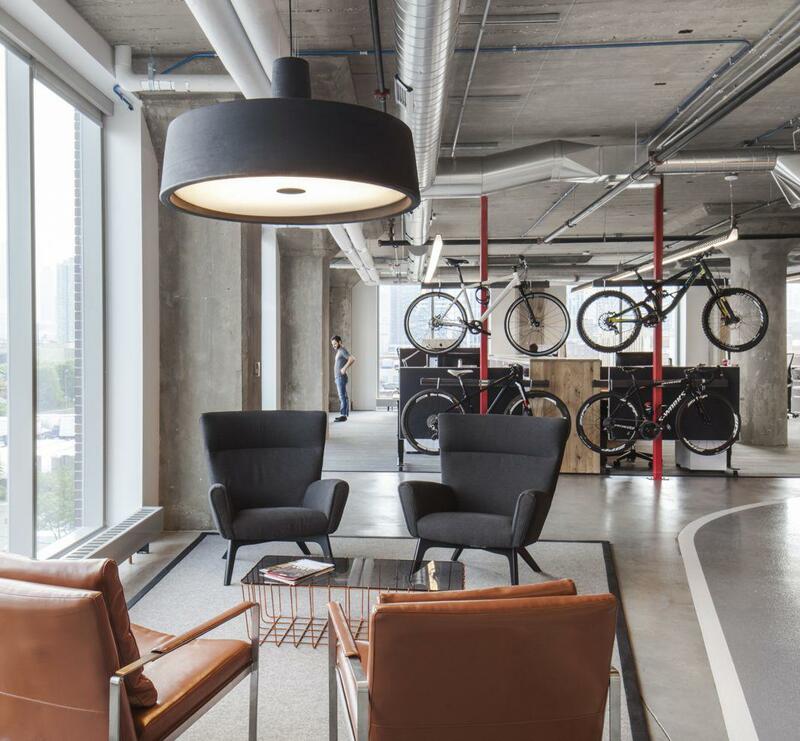 Recently architecture and design firm Perkins+Will completed what might be the ultimate office for bike lovers in Chicago, the global headquarters of SRAM, the world’s second-largest manufacturer of bike parts. 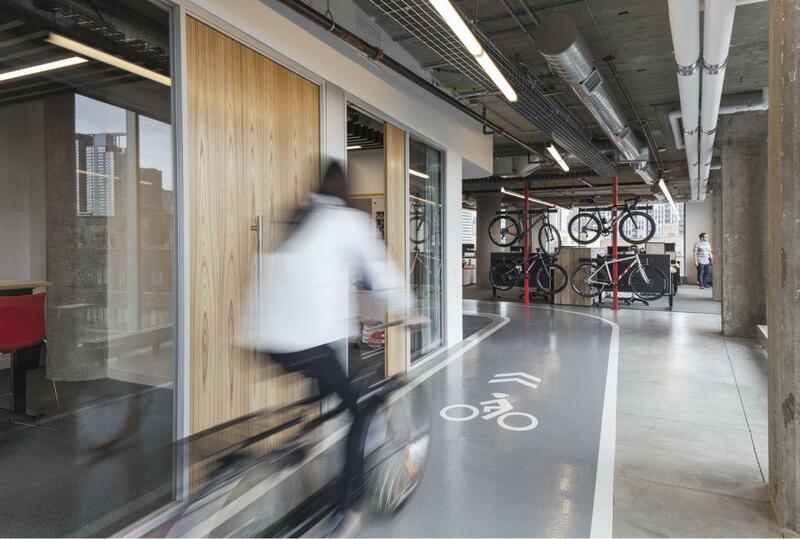 The designers created an office, located in a former cold storage warehouse in the Fulton Market district, built around biking culture. 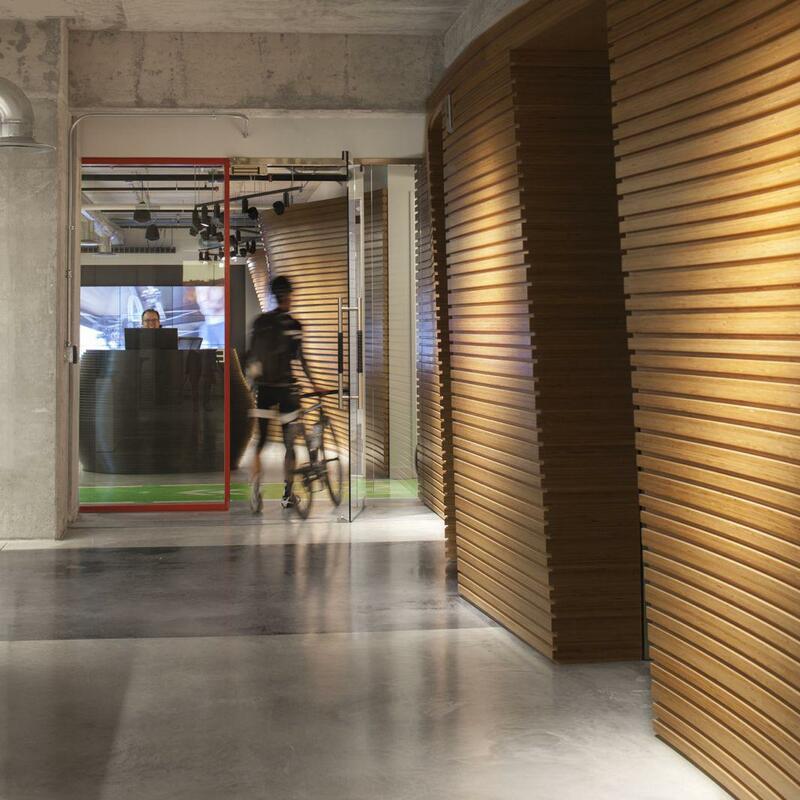 Details include bike-taped door pulls, a wavy recycled wood wall meant to evoke terrain, and an eye-catching cycling track that winds through the open-plan office, plus bike storage and facilities for the 89 percent of employees in the SRAM headquarters who commute to work by bike. Senior project manager Eric Mersmann said that employees arriving for work can enter through the main building lobby or through the parking garage. Those who come through the lobby can bring their bikes up the elevator and hang them outside their cubicles on work station–adjacent bike poles, he said. Employees who enter through the parking garage can park their bikes in a common area that includes bike storage, bike cleaning, and tire-filling areas, said design director Tim Wolfe. 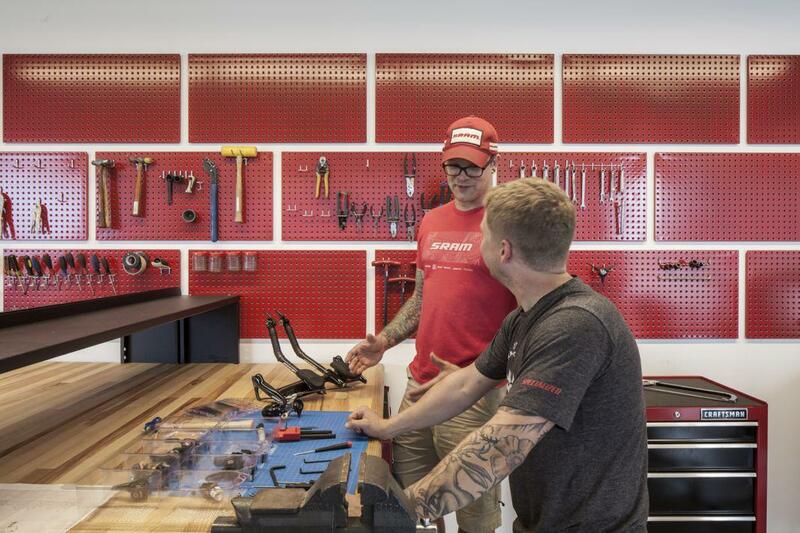 The area also includes a “common bench” that is “outfitted with all necessary tools to service your personal bike,” as well as locker rooms and showers. Upstairs, the office space includes workspaces for product development and on-site machining and engineering of parts. The 1/8-mile “test track” linking all the open office spaces together has both straightaways and twists and turns for testing prototype bicycle components. 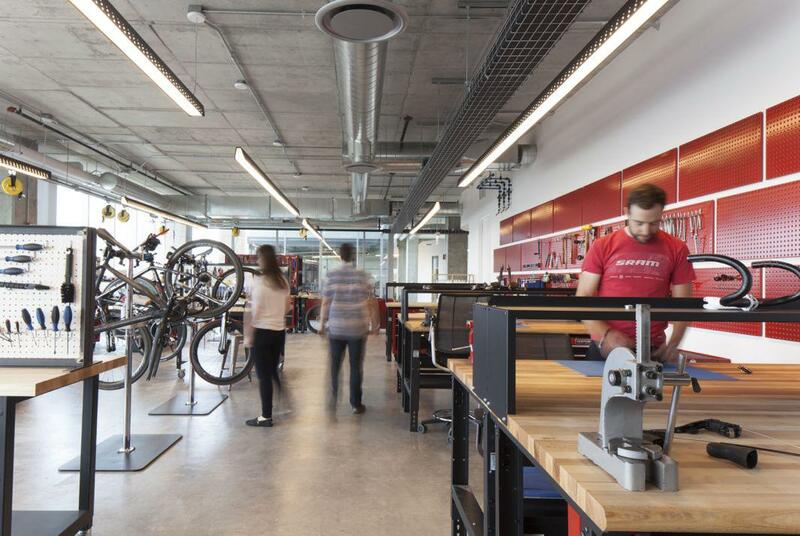 Apart from creating a bike-friendly environment for the company, how did the designers seek to reflect its identity as a leading bike parts manufacturer in the overall design choices?